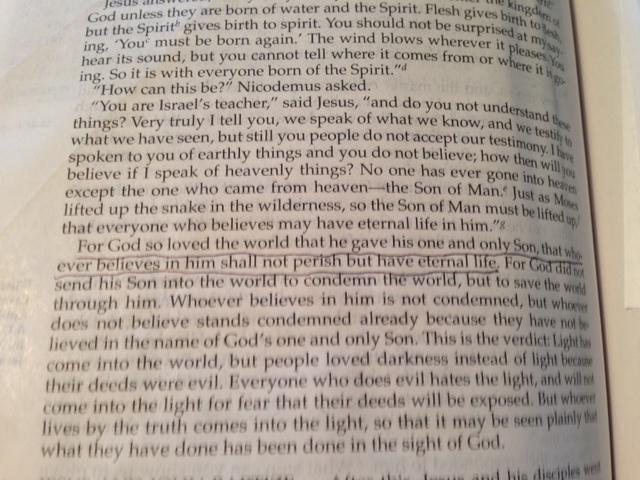 It’s all in John 3:16. We should have this verse ready whenever we’re talking with someone who doesn’t believe because this verse includes all of the important parts of the Good News. It’s an easy verse to memorize because the words reverberate around in our minds…. bouncing back and forth as we consider this astounding truth…..
God so love the world! All of us…. and that’s very good because sometimes we are very unlovable. he gave his Son for the unlovables…..
how much love does that take? a love we can’t find anywhere else…..
even though we look everywhere…. or hit bottom trying to do it all ourselves…. until we finally we open up our eyes and realize that God is what we’re looking for. I’m willing to stake my life on this truth. we were going to hell for our rebellion…..
we all rebel, some more obvious than others, but it’s there…..
whenever we do something we want instead of what God wants…..
so we deserved eternal separation from our Holy Father God. But God intervened and sent Jesus to save the world! And now believers are reconciled to God for eternity! Our eternal life with our loving, gracious and perfect God has already started! This is the Very Best News anyone could hear! Thank you for the truth of John 3:16, dear Father!